What a week - We signed up for the Walt Disney World Half Marathon and Disney announced the Walt Disney World Full Marathon Medal. When I returned home the night of the medal reveal (which is a 20th anniversary medal), Gabe decided he had to have the full medal and wants to switch. Le Sigh. We also signed up for the Monster Dash Halloween 5K which I am super excited about. Monday's run was a different route than we usually take so our distance was shortened. We ran past a house that we are hoping to purchase. It is a short sale with a few issues, but cross your fingers that underwriting doesn't kill our dream. It was raining on Wednesday so we had to move our run to Thursday. 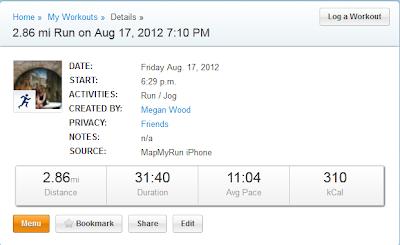 It was technically 3 miles but Map my Run thinks we ran a different route than we physically did. Gabes was correct, the timing was pretty much the same, yet his states 3 miles. Sunday long run. Now, I will be the first to admit Map my Run was WAY off on this run. There is no way we ran 7 miles with an 11:47 pace. I am putting us around 12:30 since we took our time and had a few nice walk breaks. This was the first time I have had issues with sweat running into my eyes. I recently had LASIK and prior to that, I never had that issue thanks to contacts protecting my eyes. I do not like sweat in my eyes. Not one bit. We stopped quite a bit along the run so I could take photos of the Tampa businesses dressed up for the RNC. I will post about that later this week. Let's just say, you can't go anywhere in Tampa right now without seeing an elephant, and no I do not mean Busch Gardens. Speaking of elephants.......we passed this elephant being escorted around town a few times on the run. Here come the delegates!